Physicists from the CNRS and the University of Warsaw unveiled an instability at play in the primordial universe that modifies the theoretical interpretation of the cosmic microwave background observations, and which enables one to severely constrain scenarios of inflation built in fundamental physics. This work is published in Physical Review Letters. Recent cosmological observations, notably from the Planck European satellite in 2013 and 2015, enabled us to confirm the theory of cosmological inflation. According to the latter, the seeds of galaxies and clusters of galaxies originate from microscopic quantum fluctuations stretched by a phase of accelerated expansion of the universe more than 13 billion years ago. Even better: the simplest inflationary models economically explain all the data. This apparent success leaves cosmologists and high-energy physicists puzzled. Indeed, their understanding of physical theories, in particular of quantum gravity, suggests much more complex inflationary scenarios. Moreover, current data provide no clue to guide them, amongst all theoretical possibilities, towards a finer understanding. 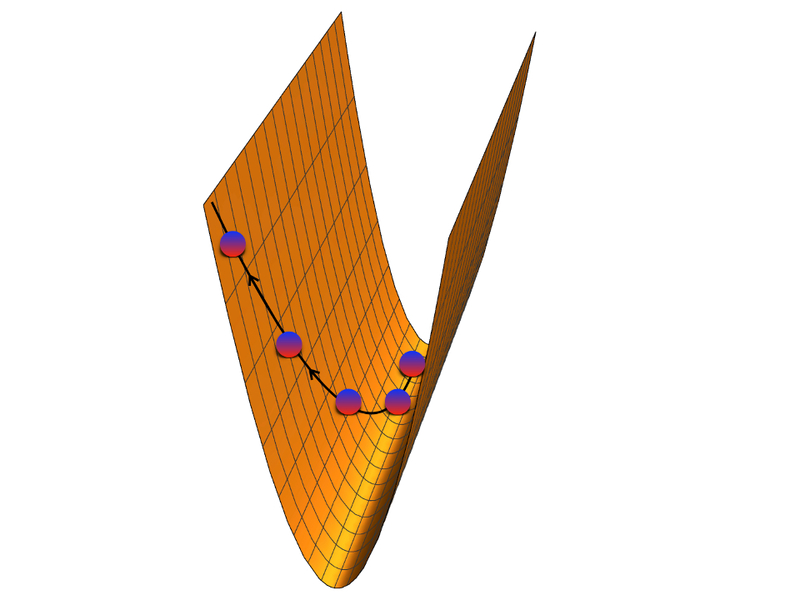 In the simplest inflationary models, this potential looks like a canyon with a gently slopped valley but steep walls, so that the scalar fields are stabilized in the valley. However, the two physicists noted that another effect should be taken into account: the fields generally evolve in an internal space with curved geometry, like the coordinates describing a sphere for instance. When this curvature is negative – a very frequent situation – all trajectories tend to become unstable, and even steep walls can not in general prevent the scalar fields from being expelled away from the valley: inflation is destabilized (see Figure a). This phenomenon, which researchers named Geometrical Destabilization and which had not been identified before, can prematurely end inflation. This premature end of inflation modifies the characteristics of the primordial cosmological fluctuations generated in these models, and hence the theoretical interpretation one can deduce from observations. This mechanism also enables one to constrain in a unique manner high-energy physics theories, in particular their internal geometry, strengthening the close links between cosmology and fundamental theoretical physics. Numerous popular models are subject to the Geometrical Destabilization which, without necessarily ruling them out, radically modifies their properties. They will have to be further studied in the light of this discovery, which reshuffles the cards between theories that were so far considered excluded or favored by the observations. arXiv: "Geometrical Destabilization of Inflation"